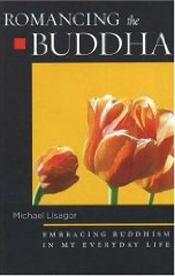 Michael Lisagor's popular book Romancing the Buddha: Embracing the Buddha in Everyday Life (2003) is an entertaining introduction to Buddhism and lessons on applying Buddhism to daily life. Together with his wife, Lisagor started his Buddhist practice in 1969. Three decades later he shares his experiences by applying the principles of Nichiren Buddhism to cope with depression, his wife’s serious illness, raising two daughters, and finding happiness and hope in our turbulent society. Says one reviewer on Amazon: "If you are looking for a great gift for yourself, or someone else, I suggest [this book]... I just finished reading it and it was so refreshingly honest and encouraging. I am so glad that I read it." Lisagor's book has also been adapted for the stage. Recently, Lisagor has drawn on his background in technology and consulting, and authored Winning and Managing Government Business: What you need to know to deliver services and technology to federal, state and local agencies; and The Enlightened Manager: Lessons on Leadership. Lisagor is also a popular motivational speaker and workshop leader and is active in the local writing community here on Bainbridge. He is married to writer and artist Trude Lisagor.